Sweetcorn Relish is my absolute favourite burger topping (although never alone), making it at home means none of the gloopy nonsense this is bright & zingy. Sweetcorn Relish: The Ultimate Burger Topping! Sweetcorn Relish really is my favourite thing to have on a beef burger. 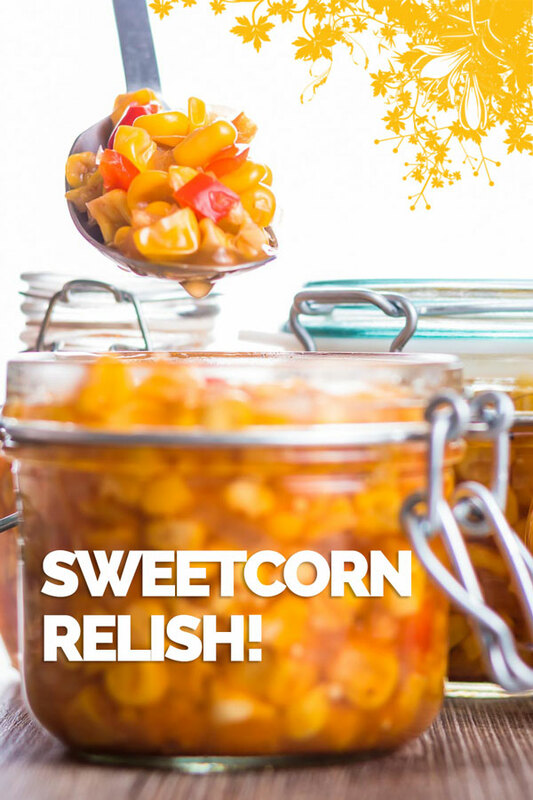 Because our sweetcorn crop has done particularly well this year we have plenty to make up a batch of this zingy and bright little relish. I have to confess to being a bit prudish about the sweetcorn relish you buy in jars. It seems to have a gloopy horrible texture that reminds me of frog spawn. As a result, I have reverted to my pickling roots and make it with a vibrant cider vinegar pickle. I add loads of mustard seeds, black pepper and of course chili which you could leave out. 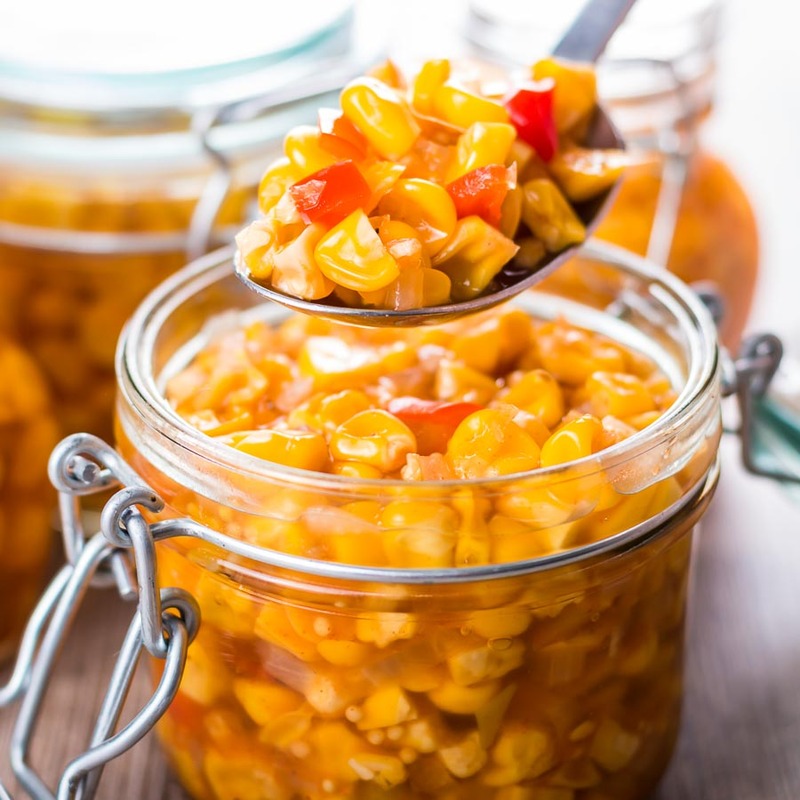 In many ways, this sweetcorn relish is similar to my pickled chili recipe! I love preserving our produce and there are a few recipes knocking around on my site. 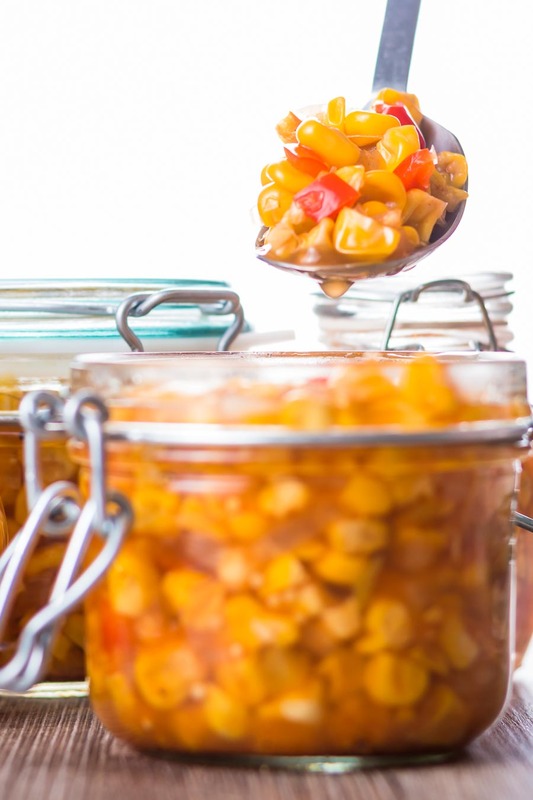 Everything from tomato ketchup to passata and a lovely chili jam feature alongside this sweetcorn relish recipe. For some strange reason, we had struggled with growing sweetcorn for years. Disappointing as we are surrounded by thousands of hectares of land filled with the stuff. I have always put it down to the fact that we garden “organically” and don’t spray with whatever the local commercial growers do. However, it would seem that we were planting out too early. This year we delayed planting for a few weeks and they have done wonderfully well. So much so that there will be more recipes heading your way before the season ends. Naturally, a much larger batch of this Sweetcorn relish making sure it lasts through to next season. Take a slow stroll up the garden. Run back a quick dunk in boiling water. Liberally apply butter and black pepper. However, having so much of it means I can make all of the things I miss out on most years. I guess I am bit strange but I hate buying vegetables. When you have spent months cultivating produce then it feels very wrong to pop out and buy something off the shelf no matter how much you like it! As a result, I am overjoyed this year to have enough to make sweetcorn chutney and a host of different chowders and soups. 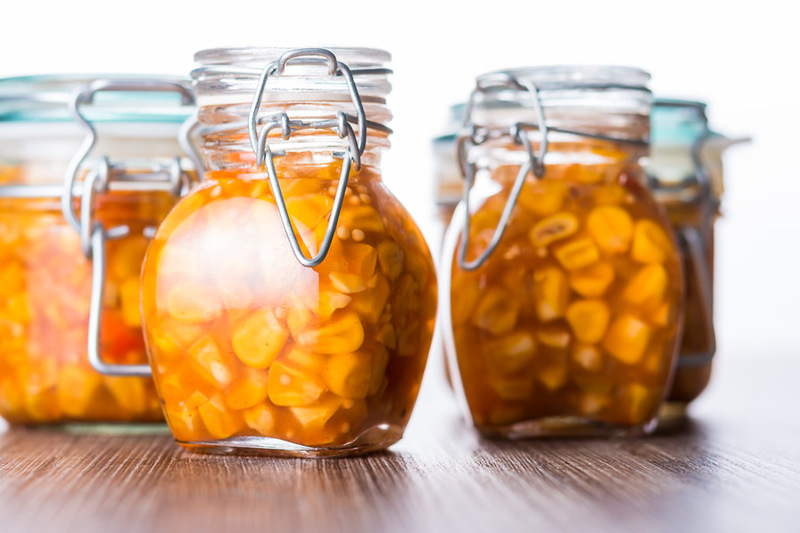 How To Preserve Sweetcorn Relish? I will not go too much into the canning process as there is so much information out there. Some of which verges on the ‘if you don’t do this you will die’ approach. However, we have been canning produce since we moved to Hungary in 2008 and have never had a bad batch of anything. I initially thoroughly wash jars and new lids. Then I scorch in boiling hot water and transfer into a very low oven at 100°C. Leave them there for at least 30 minutes although it is typically and hour. Finally, I ensure the pickle or chutney I place in them is at a rolling boil before transferring into the jars and sealing immediately. The sound of the lids popping is a joyous wonder that I never tire of. You can preserve this anyway you wish, I personally favour heating jars in a very low oven (100°C) and then filling with the hot pickle and sealing immediately, this recipe will fill two 600ml jars. The calorific value of this recipe is for the full amount. A truly lovely idea! I love the little kick added to this – definitely something to try very, very soon! Thanks for the inspo Brian. We were looking for something to top our burgers next week, and this looks like something to try out! Thanks for sharing! Thank you Brian for sharing such a great recipe. I am always on the look out for new burger toppings and this one sounds delicious. Enjoy Loyola, this is a fab little topping. Such an awesome idea! I make just about everything from my garden into relishes. From cucumbers to zucchini to hot peppers, but I haven’t made sweet corn relish!! This is perfect! Thanks for the inspiration, Brian! I know how that feels, enjoy! Oh this recipe sounds so delicious and PERFECT for Summer! Can’t wait to try! I never thought of trying this on a burger but that is an awesome idea!!! I can’t wait to try it soon. Thanks for the great recipe. Thank you, I hope you enjoy it as much as I do! I have never tried corn relish before, but sure sounds delicious and looks pretty. I’d probably put it over a rice bowl. I’ve never made and corn relish before. This recipe looks awesome. I might give this one a go next season, so I just had one clarifying questions. 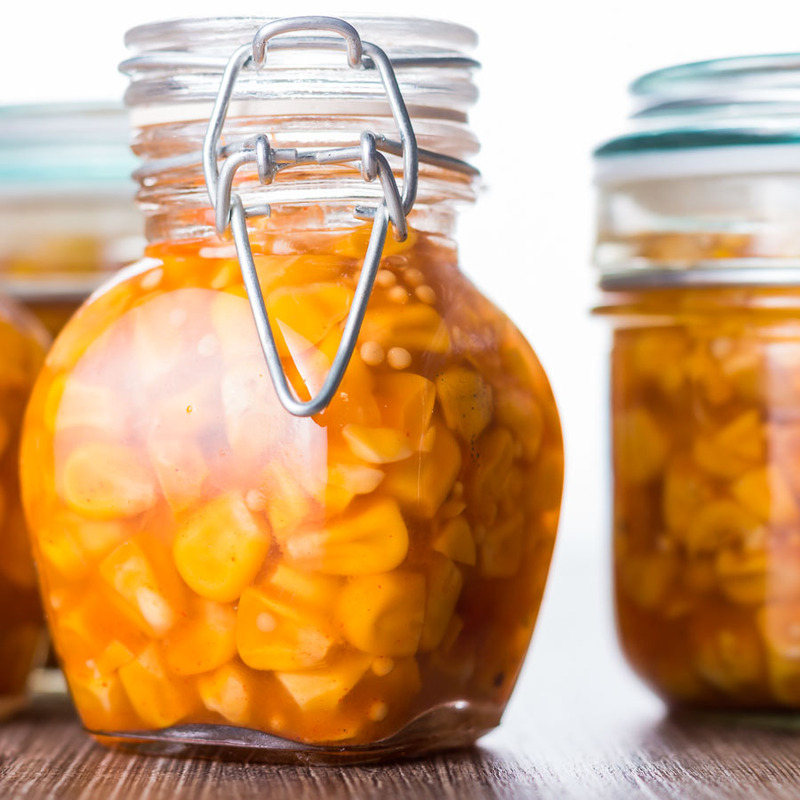 How and how long do you process the jars to preserve them? I’m assuming in a water bath for 10 to 20 minutes, but I’d rather be safe than sorry! I initially thoroughly wash jars and new lids and then scorch in boiling hot water, then transfer into a very low oven at 100°C and leave them there for at least 30 minutes although it is typically an hour. Finally I ensure the pickle or chutney I place in them is at a rolling boil before transferring into the jars and sealing immediately. My grandma used to make corn relish, but we’ll have to make it to try on our burgers! Great presentation too! Thanks Judy, based on the comments I have received it looks as though it as a relish that has skipped by a couple of generations! This sounds like such a great idea! I love corn of any kind, and this is a brand new idea to me! I love it! this looks so good, I love the flavours – sweet and sour and chilli hot. I love piling relishes onto my burgers so will be making this up. Bookmarked and yummed! Just wondering if you were to char the sweetcorn first whether it might taste good or weird. Will report back Brian! This would go well with tacos 🙂 Or even just to dip chips in. Wow, never thought to add corn to my burger! Have you tried this on hot dogs? Or sausage? I wonder how that would taste 🙂 Your recipe looks delicious though! I haven’t Michelle, I rarely eat hotdogs but do make my own sausages so will give it a try with our next batch… It does however work wonders as a garnish for a chili or spicy bean soup. wow a relish corn, I would eat it by spoon and also put it on everything and anything! perfect! You know, I have never put corn relish on my burger. Now I need to try it! I thought it was a really common thing to do, however I do live a very cosseted life in the middle of nowhere haha. Sweet corn relish sounds so succulent on a burger, although I never would have thought to pair the two. I would love to have this on a salad any day of the week! I have some frozen corn from my mother’s garden, so I am needing some interesting ways to prepare it. Nicely done! I like spreading seeds of ‘adventure’ when it comes to food, I love it. This relish looks absolutely gorgeous and so tasty! What a great recipe! Gonna have to hold onto this one to try next season. Thanks Chris, really is a great store cupboard fall back to give a lift to loads of meals and sandwiches. haha! that’s my next burger’s try! What an interesting recipe. I may have to give this a try. Pass the tortilla chips and a cold beer please!! I need a big bowl of this corn relish now!! My mom use to make this, decades ago and way back when before I knew what good food was. I now love this sweet corn relish and have yet to make it on my own. Thank you once again, for the delicious inspiration! You won’t get an argument from me! I love relishes of all types. Where I live they put sweet corn and fried onions on hot dogs. Now my favorite hot dog topping is mustard and relish so I didn’t expect too much, but it was surprisingly good! Hot dogs around here are very odd affairs with the dog stuffed inside the bun so no room for interesting fillings, I’ll certainly try this with mustard on a home made dog though, sound awesome.